I think they call it Gotham Steak because you have to be Bruce Wayne to be able to afford eating there. I guess it's not the most expensive place in the world, but it's too expensive for me. Appetizers cost about $20 and a steak will cost you around 40 or 50. Throw in a side for 12, their cheapest bottle of wine for 60 (I have read that restaurants often rip you off on the second cheapest bottle of wine, since they figure most people don't want to look cheap and order the least expensive, which is usually a pretty good deal), and maybe split a dessert for, I don't know, probably 15 bucks (not listed on the website). Add tax and gratuity and you're easily spending over $130/person at Gotham Steak. I think this menu was designed for hedge fund managers circa 2006 who would be willing to drop $400/night at the then under-renovation Fontainebleau. While I'm at it, can we please not call it "Fountain Blue?" It's named after a chateau in France named "Fontainebleau," whose name comes from "Fontaine Belle Eau." For all you gringos, it's pronounced "Fawn Ten Blow." That's what the name is. Back to the restaurant. Lucky for the rest of us jokers, Miami Spice allows the common man to still spend more than he normally would on a meal, but get a little taste of the good life. If you're lucky, you'll get a waiter who doesn't roll his or her eyes when you ask for the Miami Spice menu. Ours said "oh, it's a great deal." That was nice of him. He was a real pro. Attentive as could be without being annoying. 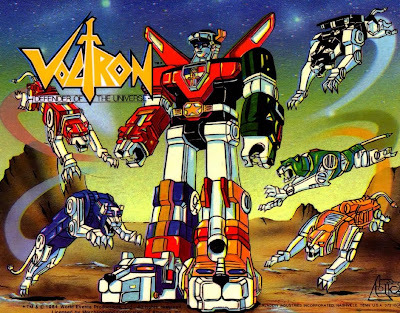 See, all those cats are robots controlled by the different members of the team and they can come together to become Voltron and defend the universe. Pretty awesome, I know. The rolls? Right, the rolls. I ate, if I remember correctly, 7 or 8 of them. Beat that Voltron! That is how I keep all 155 lbs. of hugeness on these bones, baby. For starters, I had the heirloom tomato salad with feta and watermelon. Delicious and refreshing. My girlfriend had the tuna tartare that came in a baseball-sized portion. For Miami Spice items, they were very generous. When I remarked to the waiter that it was a rather large portion for a tuna tartare, he replied "you should see the regular one, it's even bigger." Wow. That's a lot of raw fish to eat before you eat a big steak. God bless America. For my main course, I had the braised veal cheeks. Sounds cute for some reason. They were incredible. Our waiter said they were cooked for 6 hours or something like that. Maybe it was more than that. I think it was more. It was more. Renee had skirt steak, and that was delicious, too. The accompaniments were wonderful so that a combined forkful was packed with big flavors. Hers had bacon and spinach and mine had polenta and roasted tomatoes. I even got to eat like half of hers, so by dessert time I was already stuffed. So what did I do? I ordered doughnuts, of course. I like that they spell them that way on the menu rather than "donuts." Probably comes from a similar psychological place as my disdain for mispronunciation (boarding school). They were awesome, but I was unable to finish them. That's a good sign for a Miami Spice dinner. I was totally stuffed. I can't really stress enough how stuffed I was. Stuffed. I don't think I even had any of Renee's dessert. Hmm, I don't seem to remember. This is why I have to write the review the night of or the next day, lest I forget things like that. A couple of things to point out. The bathrooms are outside the restaurant and down the hall. I suppose that's not unusual in a hotel, but I still don't like it. I'm fussy! The decor is not very fancy considering the prices. I will say again that we had a great waiter. We were both stuffed after our meals. Not sure if I mentioned that. And there is free valet parking (I think only during Miami Spice)! I really appreciated that. Over all a great deal. What would have cost well over $200 was about $155. That's not exactly a cheap night out, but it's pretty darn good considering the experience. You'd better hurry if you want to try it 'cause Miami Spice ends on 9/30! Here's Gotham Steak's Miami Spice menu. I only ate there once and didn't have a steak, but I hear good things. They're huge, that's for sure.